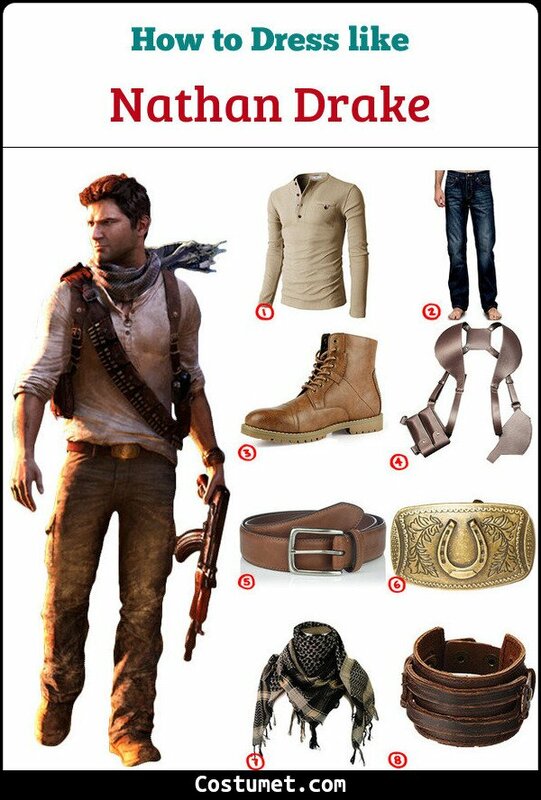 Choosing to dress up like Nathan Drake is a great choice for any video game lover. His outfit itself is pretty easy to replicate, and you can very easily find all the items you need online. You’re sure to get a number of compliments and admirable looks if you show up to your next costume party or cosplay convention dressed as this lovable Uncharted character. Most of these clothing items can easily be found on the internet, and some items, like the jeans or boots, can be found in local stores. Nathan Drake is a great choice of cosplay or costume for any video game fan. Since the Uncharted franchise is pretty widely known, you can’t go wrong by choosing to represent its most loved character. Despite the fact that Nathan Drake is a male character, both men and women can easily pull off his look with either a gender-bent version or just a short haircut. With the legendary status of the video game Uncharted, choosing a costume based on its main protagonist, Nathan Drake, is sure to get you some brownie points at any party or convention you plan on attending. In the Uncharted video game series, Nathan Drake is considered a fan favorite. Drake is a treasure hunter who travels across the world in search of many great historical mysteries and artifacts. Though he usually doesn’t have too much luck in finding treasure, he is still considered a favorite by fans of the game series due to his realistic and relatable personality. The makers of the Uncharted game franchise wanted Drake to be more human-like than the typical video game protagonists. Drake’s character is considered rebellious and charismatic. He frequently makes sarcastic quips and often acts surprisingly human-like by questioning the many disastrous situations he is put through.